Christmas Eve or Kūčios is a sacred day. Family members hurry home to be with their loved ones, debts are repaid, neighbors make peace, animals speak at midnight and well water turns to wine. The table for the evening meal is covered with a snowy white cloth and decorated with simple fir branches and candles. Twelve symbol-laden dishes are prepared. The recipe for the dish, Kūčia, has a very old history. It was mentioned in the 1573 Volfenbiutel Postilla, one of the oldest books handwritten in the Lithuanian language. In the days of our pre-Christian forefathers, when the days got shorter and darkness began to dominate, the distance between the living and spirit worlds seemed to narrow. People felt the spirits of ancient ancestors around them. Kūčia, made from grains and honey-sweetened water was a ritual food made to be shared with the spirits. It was set in a place of honor at the center of the table, to be tasted by every member of the household. As Christian traditions took hold, this ancient grain dish not only retained its important place in commemorations, but gave its name to Kūčios, the supper meal and the day of Christmas Eve. 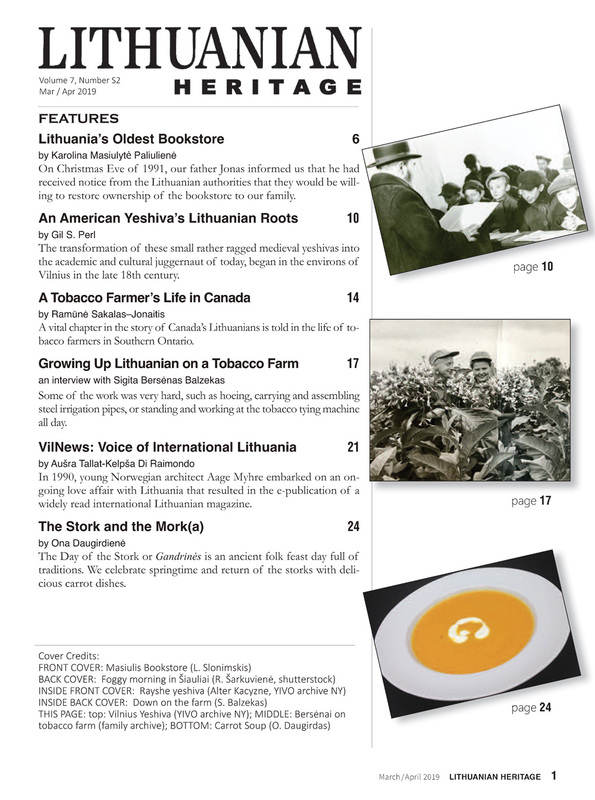 Thanks to LH reader Daina Kojelytė, you can ensure that Kūčia, the oldest and most important dish of Kūčios, is on your family’s menu this year. 1. Rinse wheat berries, place in a bowl, cover with water and soak overnight. 2. Drain, place in a medium saucepan with 3 cups water and a pinch of salt. Cook until just tender – about 1 hour. If the grains are tender and water remains, simply drain any excess. 3. Finely chop the onion. Optional: rinse briefly with hot water to reduce the bite. Your onion may be sweet enough to skip this step. 4. Dice the apple, chop the walnuts. Place the warm cooked wheat berries in a large bowl and toss with onion, apple, walnuts and dried fruit (if using cherries, cut them in half). 5. Whisk together dressing ingredients. Pour over the salad and toss to combine. Let stand for several hours or preferably, overnight, to allow flavors to meld. Serve at room temperature. 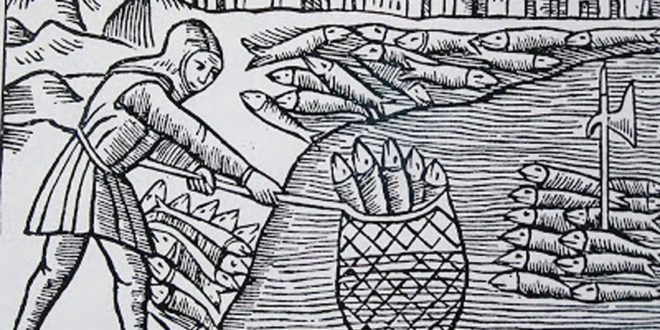 No one has to sing the praises of herring to a Lithuanian. We know how good it is. It can be eaten hot or cold, fried, smoked, salted or marinated, alone or in a complex dish. And during Kūčios, it is definitely king, creatively combined into a staggering variety of dishes. The following recipe from Živilė Vaitkienė is a classic. It was very popular in pre-war Kaunas, so when you make it today, you are continuing a delicious tradition. 1. Finely chop herring and peeled apple. Dice onion and cook until softened. Cool. 2. Chop 2 eggs. Chop the yolk and white of the remaining egg separately and reserve for garnish. 3. Remove crusts from bread, soak in water. Squeeze out liquid. 4. Make dressing: whisk oil, vinegar and sugar. 5. 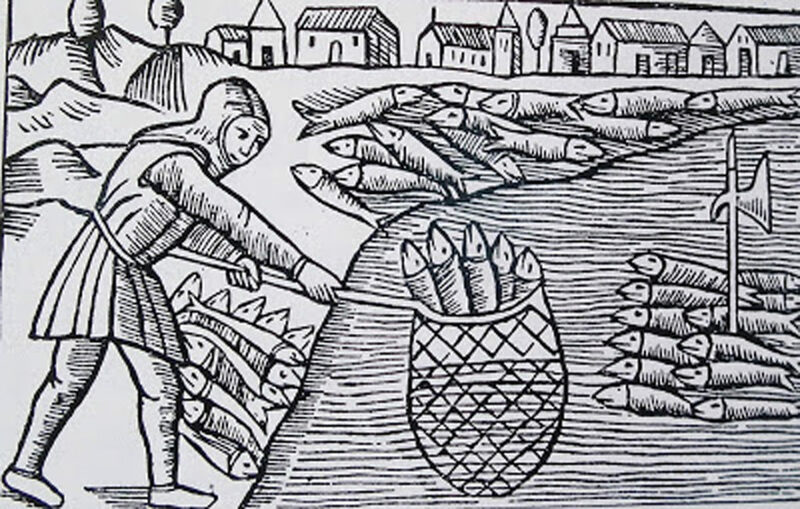 Combine herring, apple, onion and bread and mix well. Then add the 2 chopped eggs along with the dressing, and toss gently. 6. On a shallow serving plate, form the herring mass into a fish shape and decorate with scallions and reserved chopped egg. Note: The final presentation can be brought to perfection with the addition of thinly sliced radish and cucumber “scales.” Do it. Every family needs a high achiever. 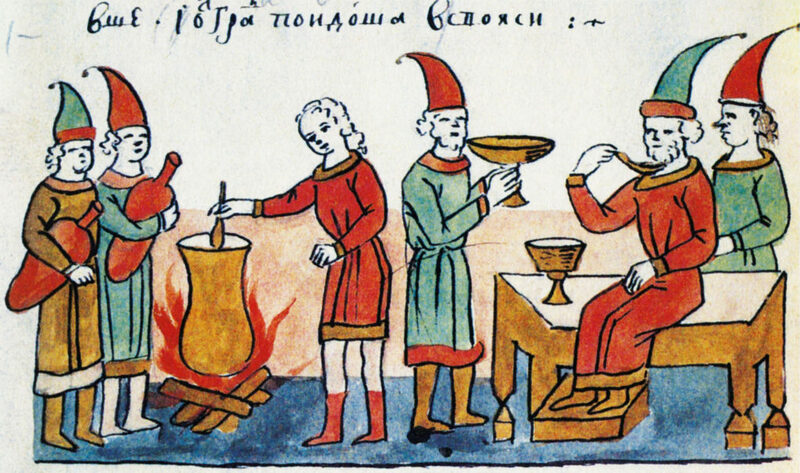 The name kisielius is derived from the Slavic word for “sour.” Kisielius is a very old food, first mentioned in the old East Slavic “Primary Chronicle,” describing how it saved a 10th century Rus’ city, besieged by nomadic Turkic tribes, from starvation. It can be made from grains (most commonly, oats), peas or lentils into a slightly fermented porridge, or into a viscous fruit dish. The latter is what most of us are familiar with today. Fruit kisielius is very popular in many northern European and Slavic countries and can be made from strawberries, gooseberries, raspberries, cherries, red currants, rhubarb or bilberries. But for Lithuanians during Kūčios, tradition rules: the crowning glory at the end of Christmas Eve dinner is always cranberry or spanguolių kisielius. Shortcuts for making kisielius abound – from simply thickening bottled cranberry juice cocktail to using packages of artificially flavored powder (there should be a law against this…). Gintaras Deikis’ wife learned to prepare all of the traditional Kūčios dishes from his mother and makes kisielius the proper way. It’s delicious! 1. Wash cranberries and place in strips of zest from 1 lemon and 1 orange. Simmer 20–25 minutes until berries have popped. 2. Over a bowl, using a metal spoon press and scrape berries through a sieve. Make sure to scrape through as much pulp as you can. Occasionally pour in a bit of cooking water to rinse the pulp through the sieve. 3. Return the cranberry pulp to the cooking liquid. Add sugar and bring to a boil. 4. Meanwhile, mix 3 Tbsp. cornstarch with ¼ cup cold water. Add ½ cup of hot berry liquid to temper and stir quickly. Then pour the starch mixture into the simmering berry liquid, stirring vigorously to prevent lumping. Cook briefly until thickened. 5. Put into glass bowl or serving dishes and chill. May be served alone or with a splash of cream. When I married into the Daugirdas family, I stepped onto a learning curve. Daugirdai did a lot of things differently from my family. I vividly remember my first Kūčios with the new relatives, because I ended up being scandalized not once, but twice. At home we limited ourselves to a modest glass of wine during Kūčios, whereas my father-in-law came to the table toting a well-sampled bottle of vodka (are Catholics even allowed to drink that during Kūčios?). My mother always served dishes made with the humble silkė (herring), but my mother-in-law brought out (gasp!) a bowl of…How-is-that-even-Lithuanian?- shrimp salad! I was aghast. 1. Defrost shrimp if frozen. Using paper towels, dry the shrimp well. Excess moisture will result in a watery salad. 2. Finely chop shrimp and eggs. Mince celery and onion. 3. Blend mayonnaise and lemon juice. Adjust amount to your liking. 4. Combine all ingredients and dressing in a large bowl. Mix, check seasoning. Note: Unfortunately, today’s farmed shrimp tends to be bland. If possible, look for wild or Gulf shrimp – they have much better flavor. But if these are not available, increase savoriness with salt, horseradish and pickle juice, to taste. Post scriptum: If you are keeping the Kūčios tradition of no dairy, no meat, you have nothing to fear from mayonnaise – it’s made from oil and egg yolks. 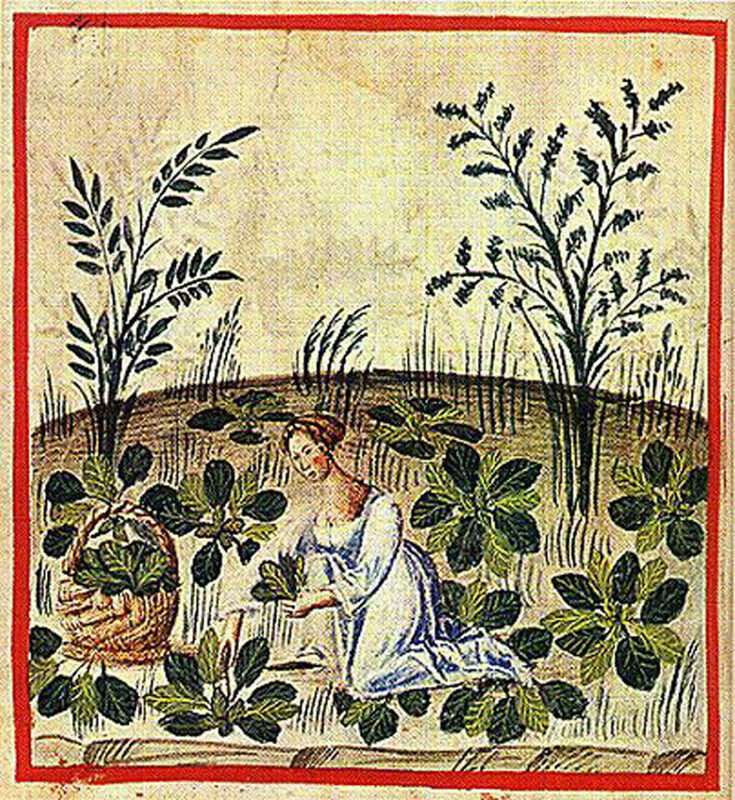 Harvesting beets. From “Tacuinum of Rouen,” a 15th century illuminated medical manuscript based on Arabic texts translated into Latin. Lithuanians love their beets. In days gone by, this beautiful and vitamin- loaded vegetable was harvested in the fall and stored over the lean winter months for use in soups and sides. So it’s not surprising that beet dishes have a prominent place on the Kūčios table. Traditionally, a vegetarian beet soup (barščiai) is served, along with as many beet dishes (in combination with herring, grains, potatoes and other vegetables) as the creative cook can devise. We have chosen a recipe that uses the very traditional beets and baravykai, but updates the flavors with fresh and dried fruit, and earthy, nutty lentils (called lęšiai in Lith.). 1. For best flavor, roast the beets: Oil lightly, wrap in aluminum foil and bake in a 375º oven for 45–60 min. If you opt for boiling, cook until slightly al dente. Cool and peel. 2. Soften dried baravykai (mushrooms) in a bowl with boiling water. If the pears are very dry or hard, soften them, also. 3. Cook lentils in 2 cups water, with celery, ½ onion, bay leaf and peppercorns. Simmer uncovered until lentils are just tender, approx. 15– 18 min, stirring occasionally. Be careful not to overcook! Remove seasonings. Strain lentils well. Cool. 4. Dice the onion and cook in olive oil until softened, but not browned. Chop the softened mushrooms and fruit to a fine dice. Add to onions along with walnuts and cook everything briefly. Cool. 5. Cut beets into delicate-sized cubes. Finely dice fresh apple. 6. In a large bowl combine beets, apples, lentils, and everything from the frying pan. Drizzle some olive oil, give several good squeezes of lemon juice and add salt and pepper to taste. Serve at room temp. Note: All lentils are not equal – most will get mushy and fall apart. Make sure you buy French lentils for this recipe (and no, you don’t have to go to France – they are readily available). They are darkish green before cooking, slightly brownish after cooking. These lentils will stay intact and have an especially delicious flavor. P.S. Any favorite home-made vinaigrette dressing will be delicious on the salad as well. 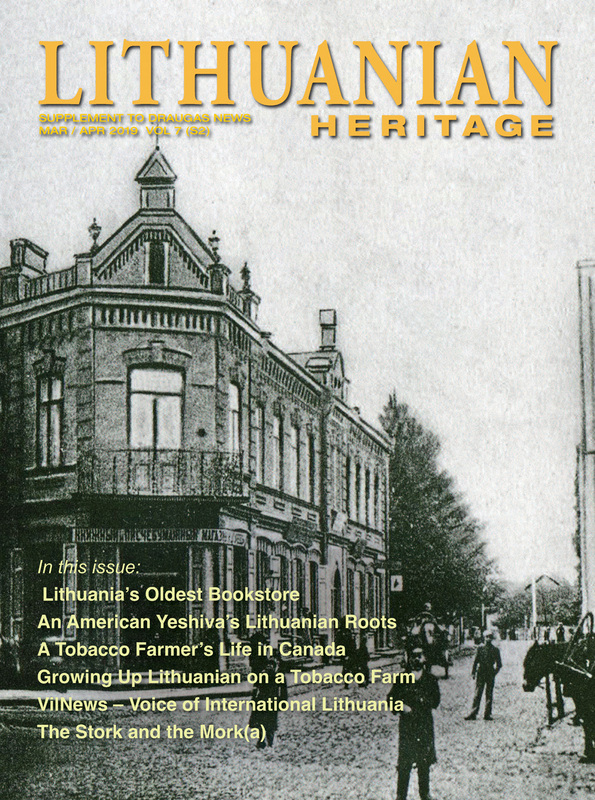 In appreciation, you will receive a certificate for one year’s subscription to Draugas News/Lithuanian Heritage. Ačiū labai!